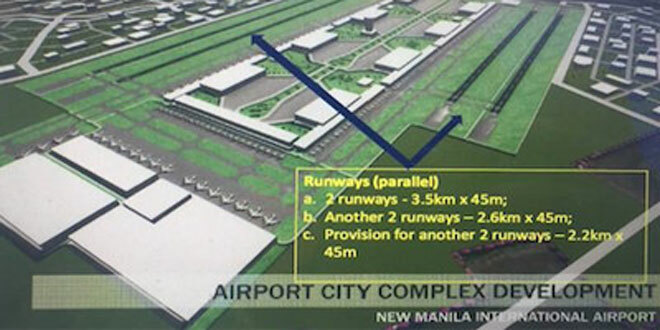 The proposed $14-B airport complex in Bulacan will have 4 parallel runways. The Department of Transportation (DOTr) revealed that the final awarding of key private sector-proposed airport projects in Manila and Bulacan may be announced early 2019. Transportation Undersecretary for planning Reuben Reinoso said the two projects—San Miguel Corp.’s P800-billion international airport in Bulacan province and NAIA Consortium’s P102-billion offer to modernize and operate the Ninoy Aquino International Airport—has still to be cleared by the Investment Coordination Committee of the National Economic and Development Authority (NEDA). The two projects form part of the DOTr’s so-called multi-airport policy. The go-ahead of the NEDA-ICC will be followed by the approval of the NEDA Board, which is chaired by President Duterte. As unsolicited proposals, the final step is a bidding process known as Swiss Challenge, which requires at least 60 days. Reinoso said they were still targeting to launch the Swiss Challenge, wherein rival bidders would be allowed to submit offers, before the end of 2018. But he explained that this would depend on when the projects would be approved by the NEDA ICC. Reinoso said the offer of NAIA Consortium remained with the NEDA-ICC pending the submission of additional documents by the Manila International Airport Authority. NAIA Consortium and SMC hold original proponent status (OPS) for their respective projects. This means they both carry a big advantage during the Swiss Challenge. OPS holders can still win the project because they have the right to match rivals with better bids. Naia Consortium’s members are Ayala Corp., Aboitiz Equity Ventures, Alliance Global Group Inc., Asia Emerging Dragon, Filinvest Development Corp., JG Summit Holdings Inc. and Metro Pacific Investments Corp. Its technical partner is Changi Airports International. Through a 15-year concession, NAIA Consortium wants to increase capacity in NAIA to around 65 million passengers yearly in four years. This is double the existing design capacity of 31 million passengers a year. NAIA’s four passenger terminals served 42 million passengers in 2017. On the other hand, SMC is planning a brand-new airport in Bulakan, Bulacan, that will have as many as six parallel runways and a capacity of over 100 million passengers yearly. Another key part of the multi-airport strategy is Clark International Airport, Pampanga’s gateway that is currently being expanded under the public-private partnership scheme.